Tun Dr Mahathir Mohamad stepped down as Prime Minister in 2003 to pave way for change and allow others below him the opportunity to move up. He was succeeded by Abdullah Badawi, who was then succeeded by Najib Razak. Today, Dr M said, the Opposition shouts about change (ubah) but their own leaders continue to hold on to power and refuse to make way for younger leaders to take over the reign. Kit Siang, who's hopping from Ipoh to Gelang Patah constituency for PRU13, has been active in politics since when the Beatles' earliest LPs. He was then the political secretary to the late Devan Nair. "He talks about change (ubah) in leadership, but Kit Siang himself won't allow a change in his own party leadership first," Dr M said in a meet-the-people session in Kempas, Johor Bahru last Sunday. Even a singular party in Cina is changing its supremo but here Musyidul Am of Dap is holding the power longer than any of its comparable in the modern time...what else to say? Mahathir is too chicken to stand against LKS in Gelang Patah. Mahathir even lost in the UMNO Kedah division polls a few years ago during Badawi's administration. Aiya, Rocky no need to spin lah. Mahathir's children are enjoying all the PETRONAS contracts with money coming in their pockets like no one else's business. LKS or LGE are not multi billionaires unlike Mahathir's children. What about Nik Aziz Nik Mat? I still remember around 15 years ago, he told everyone that he will only step down after Tun Dr. Mahathir resign. Tun.Dr.Mahathir already resigned for almost 10 years now. Nik Aziz still there. On the throne. Refused of stepping down even after he became the regular visitors of Emergency Ward. Talking about Hypocrites with serban. Mamakthir stepped down as prime minister. But why did he retain all the files on the key people so much so that even Bijan still has to kowtow to the old man ? How to blame uncle lim? Those veterans have made their billions and uncle Lim is banking his last chance to be billionaire. You know why Mamakthir is the chief campaigner for UMNO ? It's because there is a real risk now that his son will be swept away by the impending tsunami and he thinks that Najib isn't doing enough to stem the tsunami. No chance, bro. The tsunami will sweep away all the corrupt people in BN and give the rakyat reason to hold inquiries into the excesses of Mamakthir and Daim. History always repeat itself. If the transition from Kim 1 to Kim 2 (in North Korea)is to be called a "change". Voters have to wait until Lim 1 is replaced by Lim 2 before they could see a real "change" take place in Malaya. When ah? The hurdle to transfer of power in any party is not the lust for power but it is the fanaticism who refused to allow the power holder to step down. That mean, if we are seriously wanted to see UBAH to become a reality in the political landscape, we must first UBAH the mentality of these fanatics. I think the best person to take down Lim kit siang is Mahathir Mohd and MM should be worry to take up his challenge anywhere anytime MM will win big time hands down.This is the best time to kubur LKS by MM.Sure win one. true, true one day the dinosaur will extinct..
You just nailed it Rocky. They came out with Jom Ubah style but it falls flat right on to where it matters. Jom ubah konon..ubah la sangat..
Their troopers might scrambled for replies. All with the self-induce laughing, the wishful thinking, and the ridicules. All directed at you. They don't argue facts for facts but came out here throwing insults. And then laugh.. As if we are going to buy what they said. They'll undermine you, belittle you, making fun of you, but I know you'll remain unfazed bro.You have thick skin. One thing is certain. It shows that what you do DOES HAVE AN IMPACT. Just keep it up. 16 millions visitors no small matters. Don't worry bro. You are not alone in this and will never be. We'll stick around for rebuttal. Nampaknya UMNO dah tak ada orang nak berkempen lagi! Kalau dah terpaksa bergantung pada orang tua nyanyok untuk berkempen maka sah lah parti UMNO dah tak releven lagi!! Be honest and truth, the shenanigan never stepped down as P.M. of Malaysia, he stepped down to avoid being indicted by the International Justice as a politician, period. Also he thought he found himself a puppet in AB as his successor that he could continue to make all the decisions from behind. But when that did not happen, he then revealed to the voters the real situation. He not only was splitting hairs with every policy AB was implementing, he even resigned from Umno. But did he really resign , the people of Malaysia knew he will never ever will resign from a party that he needs protection from ? He was being very rapscallion, as usual, time alone proved that he did not. This time round he is fighting not only for his life, he is so pro active just to ensure his family, his children and all his cronies's survival will live on. Just remember all good and bad things will have to come to an end, especially including his dream that his son will become the P.M. one day. One can fool and cheat the voters for 22 years but surely it cannot be forever, the Malaysian voters have awaken. He cannot come up with another scam to bring in muslims from other countries to vote for Umno. Who is now standing against him ? It is certainly not the pendatangs but the Malays ! Rocky when BN no more ruling in PJ, and I see you in BV, we have a drink, ok!.....................errr in I chawan ok! LKS is still heading the DAP party? Is he still the SG / Chairman? However, those faces you see on the top 3 rows are either ousted or resigned from the party by either means of corruption, scandals or internal squabbling or anything else but for good reasons. I do not know about you but when I saw the faces (except the bottom most row), I can actually recall the reasons for their departure. Literally pointing out one by one. You are only doing LKS a favor by putting up this #BNBagus chart. LKS looks so innocent among the baddies. ,UMNO rules for 57 years. UMNO need major changes to mainain relevant. UMNO fail to make changes. UMNO/BN will lose in this coming GE13. Very well said. Unfortunately dap supporters cannot think out the box. Dr Mwas OK with the former Cuba president who started earlier than LKS. And also another African country leader who loves to come over to Langkawi regulalrly? 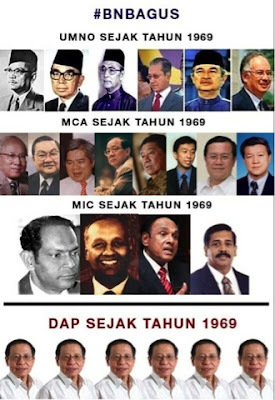 Dr M forgets that LKS was sec gen before and now holding different position, if thats what he is talking about. How come you also dont know that Rocky? Bila bubar sekarang takut KALAH. Kelentong sampah bagai seekor KUTU. Ini bukan orang tapi BINATANG. Bazirkan usaha moyang mereka datang ke MALAYA. Baru nak umum dia nak BERSARA. DAP sekadar anjing PAS yang takut tak BERANI. DAP kecut macam nenek hilang gigi EMAS. Parti Komunis ini hina pakai songkok mengadap AGONG. Melayu akan hilang hak dan hilang MARUAH. Jangan bagi Anwar jadi PM kerana tak BERIBADAT? Main belakang sumpah laknat pun dia tak LARAT. Mahathir had retired but this AH PEK (Lim Kit Siang) is still around & still got the cheek to say "UBAH" ka???? "OK! sekarang masa untuk saya mampus. Jom UBAH!" Madey sudah kelentong rakyat malaysia...jual IC ... apa Rocky nak rakyat dengar cakap Madey lagi ke ?? This Kutty is still pulling all the strings and calling all the shots and is the Man of the Shadow. This Kutty has become a grumbly old man. All others retire and let the young ones run the show but still thinking he is the PM and still hold as Advisor to Petronas. Dap ubah paD.Lks racist.Kalau nak lawan dr.m kubang pasu ada berani ka. Jawapan lu tahu usah saya TANYA. Bila ketua DAP masih orang yang SAMA. Konco bawahan bagai anjing yang digadai MATI. Kini siapakah cakap bagai burung GAGAK?. Saya juga tak tahan marah dia orang PUKIMAK. Exumno jgn lah kecewa dgn umno kerana u dah kecewa dgn hidup u. Tak dapt contract ke. Klau rasa diri ini susah org lain lagi susah dari hidup kita. Ada org lagi mengalamii kegagalan terok dari kita. Fikir mcm tu sudah la..dgn rendah diri dan hati...humbleness is gud for the soul. Poor u.
woi kenny 4:03pm ..... lu ni BTN punya lecturer ke ?? tolong kasi tahu mana ada BTN punya program nanti I bawa semua penyokong DAP pergi hadir kasi jatuh sama DAP !! Think of it this way: Looks like LKS has tussled and locked horns with every pm and presidents. Wow...a life time experience unequaled by many. Remembered even personal drivers often lament,,,,i hv served so and so over the years. Good that you brought this up. I dare you to make a police report or go to MACC. Dont hide behind 'anonymous'. Bring karpal with you. here you go again talking rubbish and displaying how stupid you are. he is not dreaming. you are. What the hell this party want to be..Kit Siang helm this party for more than 40 years, He put his cry baby Guan Eng for another next 40 years. Is DAP short of leader or Kit Siang want to ensure that the position will enrich his dynasty until another 7 descendant.He thinks he want to follow Hsien Loong that younger generation are fed-up and will kick both of them out from becoming Modern Day North Korea transition style leader. why are so concerns about this AhPek hah? If not mistaken his son has already declared that he is not fit to become the next Pm. So whether this old man win or lose, nothing will change right? but they proven they cannot change..
so it time to change BN...56 years and its time to put BN RIP. Tengku Razaleigh is 75. Sleeping in functions. Totally quiet in parliament. Neglected the orang asli and local Gua Musang. Asked UMNO to hush up on local issues. In cohort with PAS in Galas PRK. You pernah susah ka. Dia tak cakap pasal kecewa pun. Dia hanya berharap pada angin perubahan. If your roots are strong why worry. Kalah or menang is adat berpolitik. Stay focus to the topic. Do not ubah u-turn style. Itu komunis dap leader gila kuasa ka? Another flame thrower accusing without an iota of proof. DAP Standard SOP, put 4-5 comments under anonymous. why? where your supporter tak da ka? Org reti nak pencen gitula. Apek2 tua tu tak nak pencen sebab bila da bekuasa semua boleh di liwat. Nak jadi statesman kunun. Tun m baru LA statesman sebenar. Hid up bn!